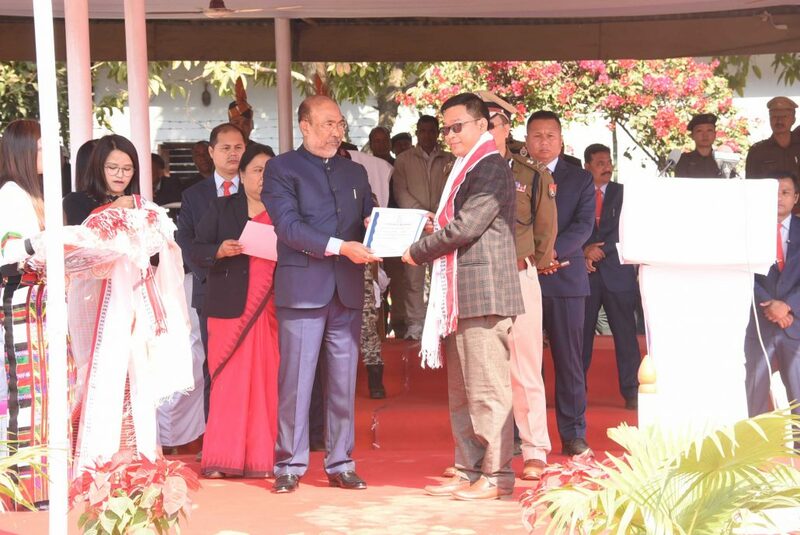 The Manipur Statehood Day celebration, 2019 was held at the first battalion Manipur Rifles Parade Ground in Imphal on Monday. Manipur became a full-fledged state on January 21, 1972. Chief minister N Biren Singh was the chief guest of the statehood day function in Imphal. The deputy chief minister Yumnam Joykumar Singh led ministers, MLAs, top officials of the state government including the police officers attended the observation wherein the Chief Minister inspected and received salute from 15 march past contingents comprising BSF, Manipur Police, Manipur Fire Service, Traffic Police, Home Guards etc. Speaking as chief guest of the function, chief minister Biren stated that a new revolution in education sector should start from grassroots so that the state could produce hard working, dedicated, sincere and patriotic citizens in the coming days. A special meeting would be convened soon to make the mission successful, he said adding that newly launched ‘School Fagat-hansi’ mission, an initiative to develop government school by providing necessary infrastructures so that it would bring visible changes and improvement in the education sector of the state. Expressing that people in the state are filled with talents and potentials, he said that there would be development in the state if we had created avenues for those talented people. Appealing to the government officials to work with sincerity and honesty for the welfare and development of the state, he said that the state would honour those officials for their dedication and commitment. He appealed the people of the State to extend their love and support to the government towards making a peaceful, prosperous and developed state. The chief minister also highlighted that ‘Go to Village’ mission was introduced to provide good governance at the doorsteps of the people living in nook and corner of the state. Mentioning that to execute such mission was a bold step of the government, he said there was an apprehension that the mission would not be successful. It may be recalled that ‘Go to Village’ mission was launched with a view to addressing the grievances of villagers in 60 villages in the first phase on May 1 last year. Reiterating that it is the duty of the government to honour those officers whose commitment and dedication have made the ‘Go to Village’ mission successful, he appealed to the deputy commissioners, sub-divisional officers and concerned officers to verify those left out beneficiaries as soon as possible so that the eligible beneficiaries can avail the benefits under various welfare schemes. During the function, he also felicitated various officers who had been engaged for the successful implementation of the ‘Go to Village’ mission.